As we move towards the election, in the marginal seat of Bentleigh, candidates are rightly pondering public transport issues. Trains are already getting a makeover thanks to recent frequency increases and the Bayside rail project. So then… what of the buses? These are important — many people use (or could use, if they were better) buses to access their nearest station, as well for local trips. This applies all across Melbourne of course, but I’m going to look at some specifics in the Bentleigh electorate. Significant routes in the electorate include the not-quite Smartbus 703 (east-west along Centre Road), 822 (north-south along East Boundary Road), and the 630 (east-west along North Road). There are numerous other routes as well. Elizabeth Miller (sitting; Liberal) — as far as I’m aware has not expressed a particular view on buses, though in the past when I have asked she has enquired with PTV on the 703, and reported back that they believe an upgrade between Bentleigh and Clayton is warranted due to demand/crowding, but that Bentleigh to Brighton may not be viable (eg on Sundays) as there isn’t sufficient demand. Not sure how you measure demand when the service doesn’t run. 12/9/2014: A commenter below notes a petition being distributed by Elizabeth calling for the 822 bus to stay where it is. 12/9/2014: It’s unclear if Nick supports other changes in the 2010 bus reviews, but at Wednesday’s MTF forum, he made it clear that he is aware of them. Sean Mulcahy (Greens) — agrees with moving the 822, but has told me he wants to see it done as part of wider network reform. 12/9/2014: Sean said at Wednesday’s MTF forum that the Greens policy is to implement all the bus review proposals, subject to community consultation. Chandra Ojha (Independent) — wants to see service upgrades on route 703, and also other routes including 701, 626, 630 and 824. The 2009-2010 bus reviews included a great deal of local input, and came up with a variety of proposed changes that would work together as a network. Broadly, routes categorised as Principal or Main were proposed to be straightened-out and made more direct (which is a good thing if you want more people to consider bus travel against driving their cars). Local routes fill in the gaps for people unable to walk to a Principal or Main route. Some changes were flagged as requiring road upgrades first, such as traffic lights so that buses can more easily make right hand turns into main roads. I’m going to go into some detail here, as the proposed changes were not widely publicised. Skip over this bit if you’re not interested in the specifics. 627 split into two routes — this was done, it’s now the 625 and 626. This is good; it was incredibly confusing before. 701 re-aligned to replace route 822 in Marlborough Street in Murrumbeena, and extended from Bentleigh along Brewer Road and Marriage Road to Brighton — this hasn’t happened. They also considered changing the 701 from heading to Oakleigh to instead go to Murrumbeena, though this isn’t reflected on the map. They also made recommendations on service levels — at the time, they expected train frequencies to be standardised to 15 mins, and what’s happened instead is a (good) move towards 10 minutes. You’d never want to cherry-pick of course, but from the looks of it, a good first stage of changes would be re-routing (but not truncating or extending) routes 822, 701 and 767 in East Bentleigh. That’d be cost-neutral, I would think. The logic was that the Clayton grade-separation is years away and causes long delays to buses, and also that the northern half of the route is much busier. This makes some sense, but there are two main issues — firstly passengers from the Brighton and Bentleigh areas would have to change buses at Clayton (and walk across the tracks) to get to Monash and beyond. Wait times might not be too bad heading north if the northern half of the route runs frequently, but you’d risk long waits heading back the other way if you just miss your connection. Secondly, it represents a big reduction in service from the present 15 minute weekday frequency. The government obviously realised this as they quickly put out a press release which welcomed the overall report but specifically said they didn’t support the frequency change. The report didn’t specify if the proposed frequency would apply all week including weekends (which would be an upgrade), or just on weekdays during daytime/peak (a downgrade). Unfortunately we don’t know what PTV has in mind for the rest of the network because only the rail plan has been released; not the plan(s) covering buses and trams. However we do know they intended to sort routes into tiers, and upgrade the most important routes to high-frequency operation. There are other issues of course apart from network structure. The frequency of services needs addressing, particularly on weekends when many people are travelling, some routes are over-crowded, almost all have long waiting times, and hundreds of buses sit idle in depots doing nothing. Better connections with stations and other local amenity, and a route structure which ensures buses are more competitive with car travel (while still effectively serving people who have no choice) is vital for all those areas beyond walking distance to the trains. The changes proposed in 2010 are probably a great basis for network reform — for the most part it’s hard to think of reasons why they shouldn’t be implemented. 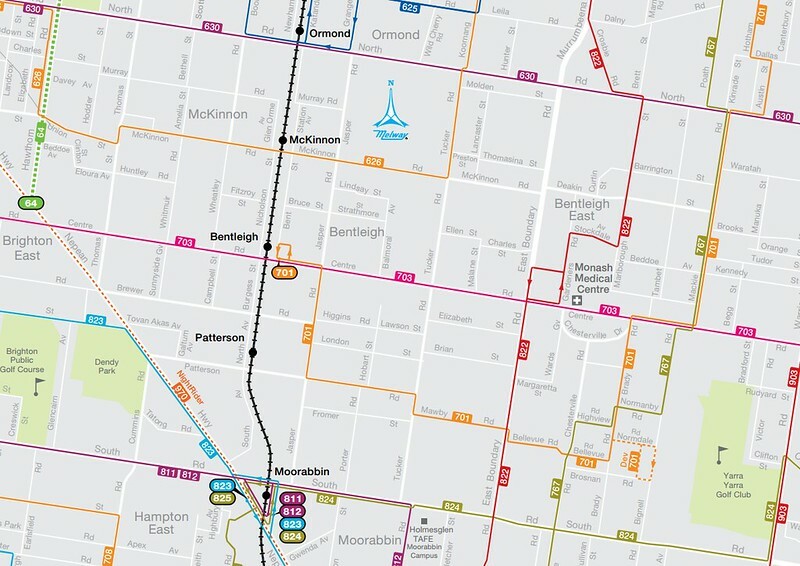 It’s all very well for (some) candidates in Bentleigh to say they’ll move the 822 onto the main road, but you shouldn’t be fiddling with individual routes in isolation. It should be part of a plan to ensure a cohesive, usable network. The full bus review reports were never released (unless you sent away for a CD), but I’ve put them online here. Metropolitan Transport Forum/Leader Newspapers are holding local transport forums with many candidates attending. Glen Eira is this Wednesday. I’m still miffed that the “Bayside rail project” doesn’t involve the rail line which is the most bayside – the Sandringham line. It is beyond belief that the government doesn’t consider running buses 7 days a week along all of route 703 to be warranted. I think running 703 to Middle Brighton on Sundays, would get more use than other routes in the area. 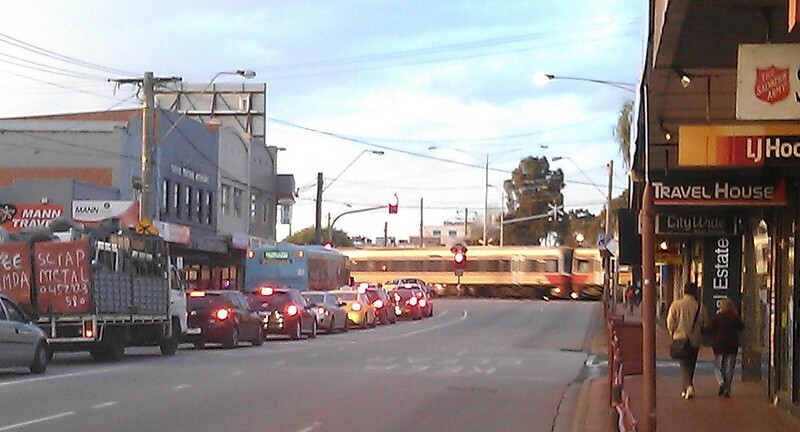 E.g 216/219, 220 which really should be cut back to Elsternwick. Brighton is one area, where we have money waste on a lot buses carrying no one or very few. Any idea where Wyndham is? Or didn’t they get a bus plan? It’s interesting comparing the plans with the recent changes by Transdev. There are similarities in many cases, but Transdev has also taken things backwards in some areas, like the cutting of the 908 off-peak. With 825 being extended north from Moorabbin, does that mean 824 would no longer through-route? Why does the 701 run via Bentleigh instead of Patterson? That sector of the route is an east-west axis; Jasper Rd gets serviced by the 825 extension, and with the upcoming ticketing changes Patterson is just as good for a rail service since expresses don’t stop at Bentleigh (or McKinnon) anymore. @James, apologies – I uploaded the Hobsons Bay/Maribyrnong document, but missed the Hobsons Bay/Wyndham one. Will push it up shortly. @David, you may have a point. To be fair, when this was written the train frequencies weren’t as good as they are now. That said, Bentleigh is a destination for many people… I guess it’s arguable if it’s quite worthy of that bus diverting to there and then back to Patterson Road, but the 701 is labelled as a Local Route, so the view is it doesn’t have to be direct. Have the 626 (shown as route B above) terminate at GESAC and/or Monash Medical; extend the 824 from Moorabbin to Middle Brighton, and run the 812 north from Chapel up Tucker Rd to Carnegie and Darling stations. Another concern is that something in the back of my head reckons that the bus reviews were only supposed to be valid for five years before a new set would be required to take into account changes in population and destinations – i.e. GESAC, Links S/C (and closure of Safeway/Woolies at North & Warrigal). So does that mean most of the Bus Review suggested changes, whether they’ve happened or not, are very close to being obsolete? Lastly, an idea I’ve been toying with, not sure if it would work: remove all the ‘local’ routes from PTV’s responsibilities. Instead give local councils a fixed amount of money based on population, patronage and/or surface area, and let them organise with each other and bus operators. Local buses would use Myki, be branded with PTV and would be limited to timetable changes every six months (when the rest of the system changes), but nonPSR services could be freely added or removed just as with MTM and Yarra. The idea is that local councils, by definition, should have a better idea of local-type trips within the communities, so they may be better-equipped to plan for those sorts of journeys. @David Strosser – There are many within the bus industry pushing for the sort of reform you are talking of. Whether it should or could ever eventuate is a different issue entirely. @James, the Wyndham one is up now. @David, in growth areas like Casey or Wyndham, I’d well believe bus reviews produced in 2009-10 are reaching their use-by date. Much less so in established areas like Glen Eira. The changes you cite have barely made a blip in the grand scheme of things. GESAC is big, but replaced an older facility (and was known about in 2010), and I doubt anything else would fundamentally change travel patterns. As for local routes, I can see the benefit of council involvement (particularly on funding and day-to-day management) for community bus-style routes (such as should have replaced Brunswick’s 509 Hope Street route). But local routes in the context of Glen Eira and most other areas need to be co-ordinated with the rest of the network… which means the best place to plan them is still PTV. That’s fine Daniel, thanks for that! Appreciate the effort you’ve made to make them public and easily accessible unlike the Government. ++ Everyone has a right to direct and easy access to the major points of interest in the area. To the south is Southland, and to the North is Oakliegh/Chadestone combination. So most streets in the area should have direct access to both where possible. ++ Routes need to avoid the level crossings, and make use of existing grade separations wherever possible. I would say, divert around the Dandenong line, by having what you can run via Center road, and either Warragal road or that next one to the east of it, and split all others at the rail line. Other than that, I am too much of a novice about the area to provide further comment. The original review plan actually makes sense. Sad that it wasn’t implemented. Small changes in general, but useful/sensible ones. On the split of the 703, it isn’t all bad. Having used the 703 sometimes as an alternative for the 630, it is a pretty terrible service. Patronage okay but not huge. I would think that continuing the “west/lower” route all the way to Monash Uni would be the best outcome (terminating at Clayton is a poor solution, not a real solution). But it would mean that it is easier to run the northern part of the route differently, such as at a higher frequency (which is considerably busier, and seems to have different needs). As it is, the southern part is treated as a second class citizen anyway, with a terrible evening service (and lack of service through to Brighton on Sundays). It is also a very slow service, and Centre Rd is busy and slow in general. I actually dislike using it. Given the 630 currently has a 20 min frequency (10 would be nice, but probably not justifiable), 703-south would likely be adequate with that too. Do think 703-north should have a 10 min frequency (and so should 900/901/902/903, make them actually ‘smart’ buses, and sync better with the new rail frequencies we are getting and should have all across the network). Best option if any truncation were to occur would be to have northern routes from Monash (703 and 733) terminate at Clayton, and have a bigger bus bay on the northern side to pick up (maybe north bound on Clayton Rd north-side, drop off and turn-around in the side street Carinish Rd). And have southern routes (703-South and 631, not sure what to do with that but heard there were plans to also cut it in half?) continue through to this new northern bus stop, and through to Monash Uni to terminate/turn around. Good through connections, higher frequency of Clayton-Monash Uni services, people can complete their journeys to a major destination. Can continue with the “southern” parts of truncated routes as more-local routes with new numbers. 630 bus never seems to get a mention. Guess it is “good enough”. It is often busy, packed even, and the afternoon peak frequency is still not enough to comfortably deal with the demand (even with the 601). Better frequency (at least 10 min peak freq) would be nice. But weekend service is just crap given that it is a major (and sometimes busy) connector. Weekend 40 min frequencies plus Rt 900 30 min frequency mean Monash Uni connection is pathetic, and it could do with an upgrade. 822 straightening makes map sense, and probably logical sense. Not sure about moving it away from Hospital, but don’t use the route so don’t know about that. Always thought back street running was silly. Plus gets horridly stuck trying to get out onto North Rd in heavy traffic. Same thing with the 767 and trying to get out onto North Rd. Can see why review noted the need for other infrastructure upgrades (more traffic lights). New Jasper Rd service isn’t quite as dumb as it seems on the surface, as there’s a number of schools in the area, and it can get you “close” to a station from anywhere along the route (short walk through shopping strip to railway line). I think it is terrible that these bus review reports were not published on the web. Thanks Daniel for providing them at least! @Jim – while the major nodes are relevant, there are also a plethora of schools and other, smaller shopping centres in the region. 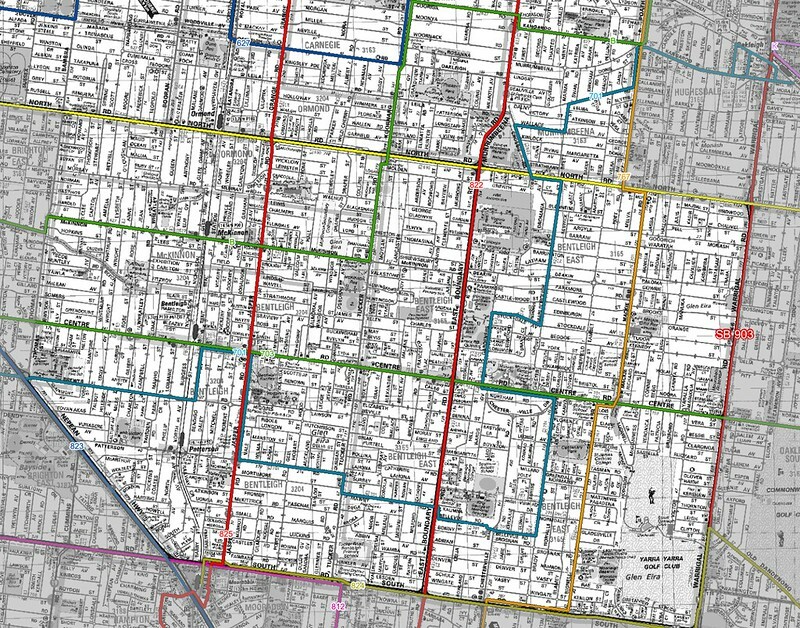 For example, the Links (corner Centre/Warrigal) is apparently a large enough destination to justify a redraw of the electoral boundaries; the section between Mackie and Warrigal Roads will no longer be part of the Bentleigh electorate from 27th November – http://www.ebc.vic.gov.au/proposedBoundaries.html – see Clarinda. A route from McKinnon station could run along McKinnon Rd; across East Boundary to Deakin then south along Mackie to Tudor St (the first of the 25ft-wide roads), activate the Delia St pedestrian crossing and intersect with the 903 Smartbus then continue along Delia St, Beryl Avenue and Riley St to Centre Rd, then turn north up Huntingdale Rd terminating on the south side of the station. This would serve eight primary/secondary schools within five-minute walks of the route, as well as linking a similar number of local shopping strips. Your comment re avoiding railway level crossings seems to work in favour of shifting the 701 south to Patterson Station and Road (not Centre Rd). The bridge at the down end of Oakleigh station is Hanover Rd. Another thought – if the 701 is to be redirected away from Hughesdale Primary School, then perhaps the 767 should be diverted east to fill that gap? The route would end up a little slower (compensated by accelerations further south), but between them the 701 (via Brett St per the old 655 rather than Crosbie Rd) and 767 would still serve the population of Poath Road. No interchanges would be compromised and the route would still be within a short walk of the Poath/North shops. 10 mins be good on. 900/901/902/903, though for some parts, e.g Sunshine to Altona it would be overkill. As for route 630, the Saturday morning frequency needs be fixed, with it running at an 25 min frequency. Should be either 20 or 30 mins. If was 30 mins all weekend, you could offset it with 900, to have a 15 min service between Huntingdale and Monash Uni. From your description, it seems that what is being proposed by Staikos is a minor tweak to the route which should improve running times and access to GESAC, and that Elizabeth is trying to stir up fear and panic. Or am I missing something? All’s fair in love and politics? @Rod, many thanks! I haven’t yet seen that petition myself. 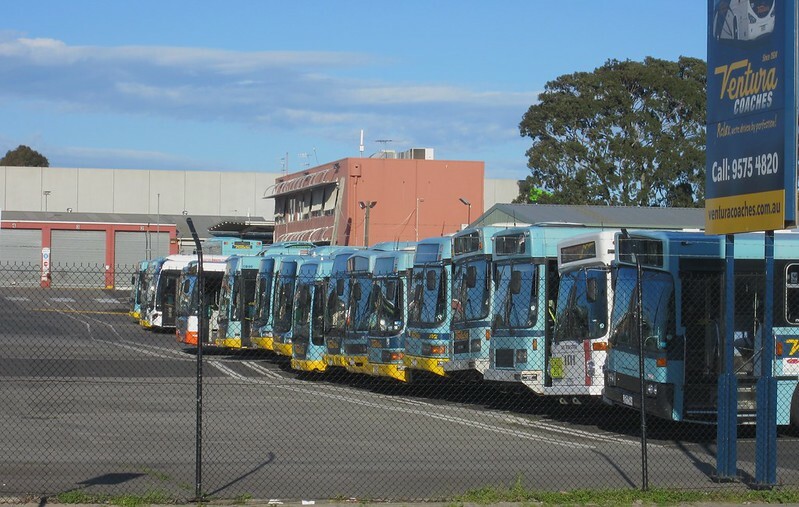 As noted above, the intent of the 2010 reviews was that the 701 would be moved to cover streets no longer served by the 822 (and remove current 701/767 duplication), though it’s unclear if Labor’s Nick Staikos supports that change as well. Running major Smartbus services every 10 minutes through the busy sections (generally eastern suburbs, I actually don’t know the west much at all so no idea about needs on that side), and 20 minute frequencies through less busy areas, so every second bus, is that reasonable or feasible? Is it worth the reduced operating cost for the “crappier” service to some areas? I would say that every 15 minutes between Monash and Huntingdale on weekends isn’t good since trains are now every 10 minutes. A 20/20 minute frequency for 900/630 would fit best (but 630 loads aren’t large on most weekends, so 3 buses/hour is overkill). Maybe running short shuttle services would be best. Or, one day, building Rowville rail. @Having 10 on the busy sections and 20 mins on the less busy sections, I think be good. 10 mins on the less busy sections, would be a waste of resources, that could be better used elsewhere. A great example of frequent services that are a waste of resources, is around Brighton, where the north south routes get very few , and resources could be much better used elsewhere, like western side of such routes. I am a student and even though I live in Bentleigh East I go to school in Caufield. The 822 bus stops in front of my street and makes travelling convenient. Instead of having to take another route (which then I’d have to walk an extra 15 mins and cross a busy road with a crossing that’s another 5 mins walk away from the bus stop), I am able to make a quick and safe return home. I understand that it may be of more use taking another route, but every time I take this route (it also takes me easily to chadstone and a child care were I volunteer at) there is always another 10 or so people who are already riding it. After school, I see many regular riders who take this route on a daily basis and it shows how useful this bus is to the local community. For everyone that lives in my area, this bus is the only one that goes into our small street and it is like a bus made specifically for the locals.